$100 Gift Certificate good for any activity/lodging/retail at Sheltowee Trace Adventure Resort. Valid for 5 years from date of purchase. $200 Gift Certificate good for any activity/lodging/retail at Sheltowee Trace Adventure Resort. Valid for 5 years from date of purchase. 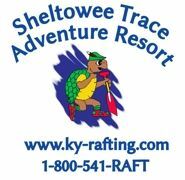 $25 Gift Certificate good for any activity/lodging/retail at Sheltowee Trace Adventure Resort. Valid for 5 years from date of purchase. $50 Gift Certificate good for any activity/lodging/retail at Sheltowee Trace Adventure Resort. Valid for 5 years from date of purchase. Bundle of firewood. Pre-purchased bundles will be delivered to your campsite. Perfect if you are going to be checking in late. *All cabin rentals already get one free bundle a night. A Topographical Map of the Big South Fork by National Geographic. This map is waterproof and tear resistant.